Last night, the US House of Representatives approved $14 billion in emergency loans to keep GM and Chrysler on life support into the new year. Senate Republicans are in revolt though and may block passage without new amendments to allow more dramatic restructuring of the company's debt. "If we don't have the forced restructuring plans in place, many of us don't believe that American car companies will come out of this in a competitive position and the taxpayers' money will be wasted," Senator John Ensign told the Washington Post (R-Nev.). I hate to say it, but I'm forced to agree with Republicans on this account: $14 billion to prop up GM and Chrysler until Obama takes office is an obvious half measure, a stall tactic that will merely punt the tough decisions down the line another couple months. While it may buy us a month or three, the proposed bailout will amount to nothing in the long term unless more dramatic actions to restructure and reinvent the American auto industry are taken. Congress is apparently set to sacrifice the only planned efforts to directly help the Big Three do the only thing that will make them competitive in the long run: produce more efficient, innovative and competitive cars. The bailout bill passed by the House will be paid for by raiding most of the funds set aside last year by 2007 Energy Bill to help Detroit develop and build more efficient, advanced vehicles. And let's not forget that $14 billion essentially ensures the Big Three will be back for more in no time at all. GM, Chrysler and Ford asked Congress for $34 billion last week, and that was almost certainly a low-ball estimate. Mark Zandi of Moody's Economy.com told Congress that the Not-So-Big-Anymore Three will require upwards of $125 billion to keep solvent through the end of 2009. The restructuring plans proposed by the auto companies are too little too late to rekindle a competitive, vibrant American auto industry, and the efforts will be guided by the same inept management that already drove these companies into the ground. And the "car czar" Congress is set to create will have authority only to keep tabs on the Big Three's "progress" along their self-prescribed restructuring plans, not require a new direction for the mismanaged companies. Finally, the bailout will do nothing to restore consumer confidence in the tarnished American car brands. Americans know a losing brand when they see one, and all the bailouts in the world will do little to restore consumer confidence unless they perceive dramatic changes are underway. 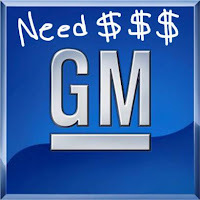 Let's face facts: GM and Chrysler are already bankrupt, for all intents and purposes. They're done. Finished. And Ford may not be far behind. The only reason there's anything left of the withering companies is because they were so big to begin with. So let's start treating them like failed companies - not like privileged children who just need a stern talking to before they get send back out to play. Forget half measures; they simply won't do the job. It's time to hit the reset button on Detroit. Remember: the goal of this bailout shouldn't be to save GM, Chrysler or Ford. It should be to protect the industry as a whole - and the American jobs it supports. That means we should put aside incremental steps and embrace a major industry reorganization. The short-term goal of this taxpayer-funded bailout and industry reorganization effort should be to protect as many auto industry jobs as possible, providing a "soft landing" for the failing companies' employees at a time when a hard collapse would shatter an already ailing economy. The long term goal though should be to radically re-invent the American auto industry, helping birth a new, innovative and competitive industry. The bailout should treat the companies as bankrupt. They are. If they aren't heading to Chapter 11 bankruptcy court, Congress should appoint a blue ribbon commission of industry, finance and restructuring experts with similar far reaching authority to require changes in management, restructure the companies, and renegotiate with their creditors. The commission would act in the public interest to develop a real plan to restructure these companies and reorganize the industry. All options should be on the table, including dissolving the companies and creating new, smaller, more competitive companies that inherit their predecessor's divisions and assets. The commission will then present their plan to Congress who will vote up or down before it is enacted. The commission should no doubt start by firing the current management of any company receiving a bailout You don't get to run a company into the ground, get a blank check from taxpayers and then go right along your merry way. Well, you did if you were a Wall Street exec getting money in the last bailout spree, but it's now (finally!) widely recognized that giving billions of taxpayer dollars to the same inept management that led a company to its current dire situation is idiotic. In the mean time, Congress can and should approve loans to keep the doors open and workers employed. When the final tally comes in, this will no doubt cost more than $15 billion. But this bailout and reorganizing plan is really just necessary to buy time for Congress to take up it's real task: developing a strategy to support the rapid development and commercialization of innovative new cars and trucks that can address pressing national interests - including breaking our oil addiction and slashing global warming pollution - while restoring the American auto industry's competitive edge. However successful a bailout and reorganization effort is, there's simply no way American car companies will emerge from their sorry state in any condition to make serious investments in the technology innovation necessary to recapture a competitive position in the global auto market ... at least not without significant, direct support from the United States government. How can we expect GM, Chrysler, Ford (or their successor companies) to invest billions to rapidly develop and commercialize the cutting edge automotive technologies - including plug-in hybrid electric vehicles and advanced composite materials - that will be necessary to outcompete Japanese, European and even Chinese companies. Instead of raiding the modest funds set aside for advanced vehicle manufacturing, we should be putting billions more on the table to spur automotive technology development and deployment. And we should be willing to directly buy down the cost of emerging technologies - including advanced batteries - to quickly drive down costs as economies of scale are reached. In short: it's time we accept that without new technology innovation policies and major new government investments, we will face the gradual extinction of the American auto industry. If that sounds like the kind of "industrial policy" that has been anathema in the United States for so long, I'll leave you with this: it was the aggressive industrial policy driven by Japan's Ministry of Economy, Trade and Industry (METI, formerly the Ministry of International Trade and Industry) that helped Toyota and Honda grow into the global car companies now trashing American automakers in markets from Springfield to Shanghai. In all fairness, sales volume did drop nearly 40% in 2008 - from 16 million to around 10 million - and that is tough on any business, much less ones with such high fixed costs like auto makers. Also, Ford is much farther along with its restructuring and even returned to profitability in Q1 '08; it was the plunge in sales that put them back into the red. Even Toyota is posting a loss this year, so it is perhaps a little bit unfair to place all of the blame for the Big 3's predicament solely on the shoulders of the management.